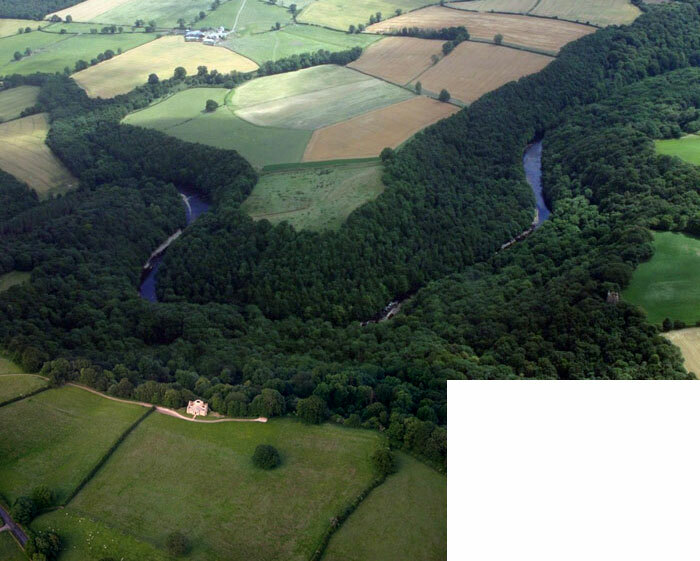 Hackfall appears today to be a natural wood, a “beautiful wilderness” to quote one of the 19th century writers who thought Hackfall wood one of the most beautiful places in the country. In fact it is very much a landscape moulded by man. Hackfall is at the Masham end of the village of Grewelthorpe in North Yorkshire. The landscape that can be seen today was in large part a result of design and work undertaken by the Aislabies. John Aislabie bought Hackfall wood for £906 in 1731. He was already famous for his landscaping work at nearby Fountains Abbey and Studley Royal. William built follies, many of which can still be seen. 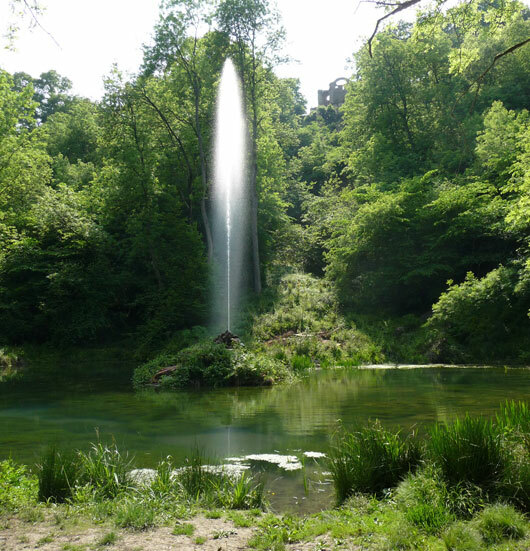 He also created grottoes, surprise views waterfalls and a fountain. Nick Lee, Barry McGrath and Alina Nosiadek took a series of aerial photographs in 2005. These have been comped together below. You can see really big versions on Nick’s site or click on the image to see a larger composite. Hackfall woods went through a long period of decline and in the 1930’s logging operations resulted in damage to the footpaths and a change in the distribution of different types of trees. Nature took over and it was feared that the precious Hackfall landscape would be lost forever. However in the 1980s the Woodland Trust and the newly formed Hackfall Trust came to the rescue. They cleared out the dead wood, managed the trees and restored many of the footpaths, always with nature conservation in mind. Hackfall is now a Grade 1 listed garden. In 2007 a major restoration project funded by a £1 million grant from the Heritage Lottery Fund was implemented. This will restore and preserve the buildings, dredge and restore water features,improve the foot paths and open up the vistas. A new car park has been provided at the Masham end of Hackfall wood. Visitors are once again welcome to explore Hackfall and enjoy its unique landscape for free. Why not contribute your Hackfall Pictures for our photo galleries.